If you are making your way over here from the quilt festival- spring 2009, welcome. This is my most recent and favorite quilt to date. It is the first quilt that I've made just for me. It wasn't a gift to give, or for my kids, it has no utilitarian purpose, it is completely a frivolous expression of art. I love where I went with this quilt and I'm hoping that this is just the start of many more quilts without reason. Not that I don't love a good useful quilt, and believe me I see many of those in my future, but I want to be able to do both and have both types of quilts in my life. Those made to give and those made to please, both made to cherish. Now the original post below was written back in March and rather than re-post I thought I'd use the existing post/photos. I was a little tired of winter but the quilt was making me feel very happy. Finished size is 18 x 21 inches, just the right size to hang on a wall. I found the original tutorial over here at lady harvartine's blog. The piecing is pretty intensive but if you like puzzles then you are already ahead of the game. 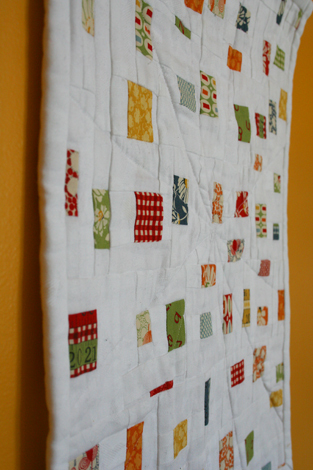 This quilt was a great project for using up those little bits of fabric that you don't know quite what to do with. I especially the love the colors and how well they contrast with the white. For finishing I did a basic (machine) line for the final quilting mainly because I'm still too chicken to try free motion stippling. This project has got me thinking about a stained glass quilt with batik fabrics on black. Oooo...ahhhh... I'll just stop there for today and wish you a Happy Monday. See, I'm feeling better already! Oh and for those of you who have asked, Fusion had a great turnout with a good deal of money raised for Ugandan children. I love the white too! Great quilt and love the quilting. Great way to use up scraps. Love your quilting. Nicely graphic, just enough color! Gorgeous! Definitely on my list to try! Lovely little quilt! The bits of color against the white is just lovely! This is a lovely quilt. I enjoyed seeing it very much. Great quilt. 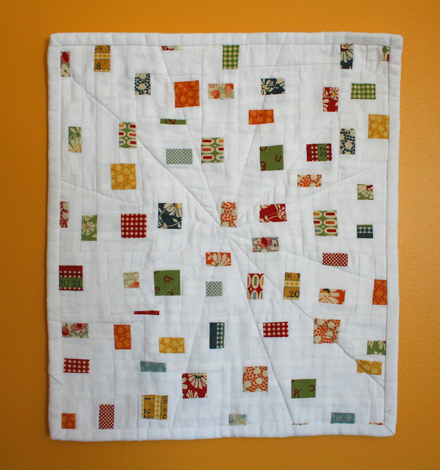 The quilting though simple is very effective. 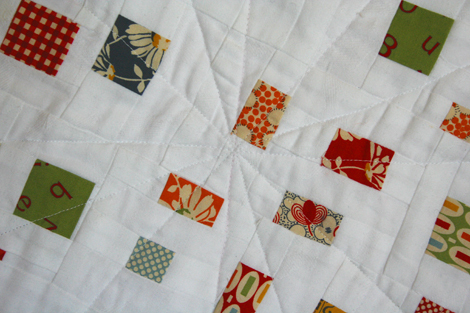 This is a delightful quilt and such a great antidote to winter. I can see why it makes you happy. Hi jen, this quilt was challenging in the piecing as you had to add pieces along the way to fill in. But because there was no prescribed pattern it was much more flexible in moving the squares around. I was a little worried about the difficulty as well so I went for a small size, I'd say go for it!